This is a really interesting wine. It’s modern, yet it’s classic, at the same time. It shows a distinct sense of place, but it is made by a leading consultant winemaker and spends 12 months in new barriques. I like it a great deal. Let’s begin with the colour. It is red, as you’d expect, but quite a faded, evolved shade of red. The nose just shouts Italy, and more specifically Tuscan Sangiovese. 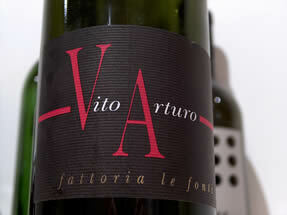 It’s vivid and bright with spice and complex dusty red fruits. There’s some tar, here, too, together with a sense of high acidity (it’s possible to detect this on the nose of some wines – a sort of lemony lift). The palate is intensely savoury and initially very tight, with firm tannins, a dusty earthiness, and high acidity, contributing freshness. There’s new oak present, but this meshes well with the intense spicy fruit. Nothing stands out awkwardly. The wine is classy and at ease with itself. If it is possible in a wine, this is self-assured. As I mentioned, it’s currently tight wound, but as the evening progresses, it begins to open up. Beautifully, in fact, into an intoxicatingly rich aromatic experience. The fruit gets deeper and richer, with some chocolatey notes. The tannins become smoother; perhaps more supple. Or am I imagining this? It’s hard to know whether the wine is seducing me beyond its own physical merits. Now four hours after opening, it’s utterly seductive, while maintaining a serious, structured edge and a distinctive savouriness. It’s modern, but it’s traditional, with a sense of place. The new Old World – one of a growing band of compelling wines from traditional regions but made in a newer style. This reminds me of one of the moments from the movie Spina Tap - the 'new originals'. Some context: Le Fonti has been family owned since 1956, but it’s only with the new generation that this estate has been ambitious. Paolo Caciorgna has been consultant winemaker here since 1994, and since 1998 Lorenzo Benini has been viticulturalist. Of the large estate, 25 hectares are under vine. This particular wine is from a single vineyard replanted in 1991. How do I score this? It’s a lovely wine that I’ve enjoyed a great deal, and fairly serious to boot. It will probably evolve nicely over the next decade, but is already drinking very well. I’m going to push the boat out and give it 94/100 – a high score, but on this performance, justified.